Real Life According to Emma: What Links Shirley Bassey, Marilyn Monroe And The Beatles? What Links Shirley Bassey, Marilyn Monroe And The Beatles? Nearly there now. It's coming up to 6pm on 27th February 2014 as I pin one of the last items on my Pinterest reveal tour. In six hours Shannon's Law will be out there. There's no news of queues anywhere. I'm grateful to chicklitpad for hosting my feature today. The subject is a fabulous necklace. 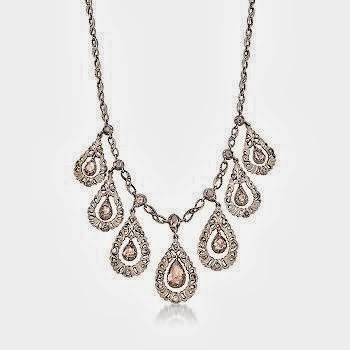 It dates from the 1920's and is a mix of white and rose diamonds. Nothing too flash then! It's the sort of thing an earl might give to a countess. But why?And what could such an item stand for? The word diamond unites so many themes and artists. At first rummage in my grey cells tips out Shirley Bassey singing "Diamonds Are Forever", Marilyn Monroe singing "Diamonds Are A Girl's Best Friend" and the Beatles singing "Lucy In The Sky With Diamonds". There's plenty of gems in Shannon's Law and they won't cost the earth. Emma thinx: Love mines diamonds in a heart of stone. On the Horns of an Emma.